Forgive us a moment while we dance in our chairs! 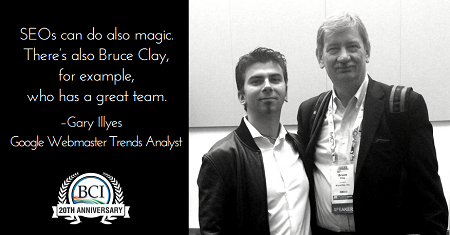 Google Webmaster Trends Analyst Gary Illyes said that he's seen our SEO team work "magic" for websites. We won't lie, it's nice when your hard work and dedication to excellence gets noticed. This is unabashedly one of our proudest moments in our 20 years in the SEO biz. Give it a watch at the 53 minute mark of Gary's interview with the gents at Stone Temple Consulting. Following Q1's biggest gathering of digital marketing experts at SMX West, marketing insights are ripe for the harvest. SEO-minded marketers have much to process after presentations by Google engineers, analysts and product development leads including Maile Ohye, Paul Haahr and Gary Illyes, who ​talked about everything from the engine ​updating its ranking algorithm factors to how Google wants businesses to think of customer service. You'll up your Google Analytics power user status and your search advertising capabilities ​as you read our SMX West live coverage featured in this newsletter. In a highly anticipated keynote, Google Software Engineer Paul Haahr took the SMX West stage to reveal just how he and other engineers approach ranking and quality. Haahr has been at Google for more than 14 years. His job entails writing code for searches, optimizing metrics, looking for new signals, combining old signals in new ways, moving results with good ratings up, moving results with bad ratings down, fixing rating guidelines, developing new metrics and more. At the end of the presentation, he and fellow Googler Gary Illyes fielded audience questions regarding RankBrain, algorithm updates, apps and authorship. Discover their answers and get coverage of Haahr's presentation, complete with his slides. 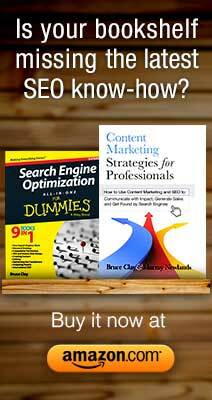 Search engine optimizers can get caught in a trap of optimizing for a search engine. It's right in the job title. But chasing search engine algorithms comes with the risk of forgetting the human customer, whom the whole business exists to serve. In a mini keynote, Maile Ohye, senior developer programs engineer at Google, pressed to change the SEO paradigm. Don't chase the search engine; don't even think in terms of your user. Think about serving your customer. Sounds simple, right? It turns out you have to redefine conversions and ​the way you map data to customers. Read how Ohye suggests we realign our thinking with the offline world in this session coverage ​from SMX West. Juan Felipe Rincon specializes in webmaster outreach and manual actions at Google. Rincon's team of anti-abuse specialists focuses on trust and safety: monitoring ad traffic, web spam, community guidelines ​​-- and manual actions. Rincon took a deep dive into how his anti-abuse team approaches spam and what types of spam result in manual actions. Independent from algorithmic actions, manual actions are the result of a human being on Rincon's team encountering pages or sites with issues and de-ranking or de-indexing them accordingly. If you aren't already collecting email addresses from your customers and visitors, there's a new reason why you should ​... so you can target them (or people like them) in PPC advertising. Using Customer Match, a Google AdWords feature that was launched in the fall, you can upload a list of emails you collected first-hand into AdWords and target those specific individuals with ads in Google Search, YouTube and Gmail. Customer Match helps you bridge the gap from that first interaction with your brand to a follow-up ad showing up later, just when the person may be making a decision. You can extend your targeting further with a second AdWords feature called Similar Audiences, which lets you show ads to people who are like the customers in your email list. New audience members who have similar interests and needs as your customers are likely to find your services relevant, as well. All of this powerful SEM ability starts with an email list. Find out more in our SMX West liveblog of the eye-opening session by WordStream's Cleo Hage. Last month, Google made a significant change to the way it features its search engine results pages (SERPs). The new layout is free of right-side ads, the top of the fold has an additional ad for "highly commercial queries." Now there are also three additional text ads at the bottom of the page. Do the recent changes affect PPC and SEO campaigns? Yes and yes! While predictions were made early on, enough time has passed since the recent update to look at some raw data and tweak your campaigns accordingly. We know that links are a search engine ranking signal, but digital marketers shouldn't focus on chasing them. A much more productive means of growing brand equity is to think about mentions at large, regardless of whether they come with a link. Linkless attribution — that is any mention of your brand or site — is a search marketing tactic ​to ​pursue. At SMX West 2016, our VP of organic search operations Duane Forrester gave an illuminative presentation on linkless attribution. Search engines, he said, have already figured out context and sentiment when it comes to linkless mentions. How are people talking about your brand online? Link or no link, the search engines are listening — and they can tell whether the light you're in is generally positive, negative or neutral. They're listening to reviews and news stories — both of which generally don't include links. They're also continuing to look at domain age, page age, freshness, relevancy, social signals, traffic volume, usefulness, history and internal linking. As you think about your digital marketing strategy, don't limit yourself to just thinking about incoming links. That's only one piece of the puzzle. Broaden your thinking and remember that you will win by what people say about you. Adapt to linkless attribution to be on the cutting edge of SEO. Google has hired Chris Poole, who created the anonymous and infamous community website 4chan back in 2003 and served as its administrator until January 2015. Poole is expected to contribute his experience to Google's community building efforts, possibly signaling changes ato come within Google+ Communities. Snapchat hired Tom Conrad to be its new VP of product. Conrad spent 10 years with Pandora, working as its head of product and then CTO before his departure in 2014. Beyond the shindigs we highlight below, you can find more than 100 SEO, content marketing, paid search and social media marketing events happening around the world in our updated Digital Marketing Conference Calendar. ClickZ Live comes to New York on April 11–13. Social Media Marketing World is April 17–19 in San Diego, California. Social Media Strategies Summit is happening April 26–28 in Chicago, Illinois. Plan ahead to attend SMX Advanced in Seattle, Washington, June 21–22. You can register with a 10 percent discount using code SMXA16BRUCECLAY. It's hard to keep up with the many changes in paid search – unless you listen to the latest SEM Synergy show. To keep you in the PPC loop, Christi Olson and Purna Virji (from Bing Ads), sat down with Bruce Clay, Inc.'s Kristi Kellogg and David Szetela to discuss PPC hot topics, such as Product Listing Ads, remarketing, and social campaigns. If you're eager to learn how to maintain a creative shopping campaign or how to improve the quality score of a mobile site, the team shares tips and tricks for both. A packed house of SEO experts come together to share their thoughts on the future of links and linkless attribution; the difficulty with attribution and understanding referral traffic; and why Google Web Console users want more than 90 days of search analytics data. This episode is a rebroadcast of a video Hangout, where BCI's Social Media Editor Kristi Kellogg interviewed Duane Forrester, Marshall Simmonds, Sha Menz and Casie Gillette. Simmonds, Menz and Gillette — all of whom were speakers at SMX West 2016 earlier this month — share their thoughts on these SEO hot topics. At the end of the show, Bruce Clay weighs in on the desire for more data, as well, and Virginia Nussey shares one reason a Googler recently gave for not proving 90+ days worth of data. What's new in social media? SEM Synergy taps into the minds of two SMM experts — Dustin Stout and Mark Traphagen — to discuss how to best utilize SnapChat and other emerging platforms right now. Design guru Dustin is CMO of LA agency Weal Media, and Mark is the senior director of marketing at Stone Temple Consulting. The two answered hot-topic questions posed by our social media editor, Kristi Kellogg. Wikipedia is developing the world's first crowdsourced speech engine, according to the announcement. Making the online encyclopedia available in spoken form will benefit visually impaired people and Wikipedia's approximately 125M users (25 percent) who either need or prefer to hear rather than read text content. Partnering with researchers in Sweden, Wikipedia plans to roll out the feature by 2017 first in Swedish and then in English and Arabic. Twitter celebrated its 10th anniversary this month. In addition to emailing brands to thank them for being part of the 10-year journey, Twitter posted a list of 10 ways marketing changed with Twitter that's worth a read. Google announced that mobile-friendliness will have an increased effect on mobile rankings as of May. In other words, mobile-friendly web pages will get a stronger ranking boost in Google mobile search results after this May update. This SEO boost ought to help motivate webmasters to make their sites mobile-friendly, if they aren't already. Google found a way to automatically remove referral spam from Google Analytics. “Ghost” referrers showing up in analytics data and skewing reports has been a problem for some time, and Google promised last year to do something about it. Spam referral data no longer appears in Google Analytics from mid-January on. SEOs may notice their referral traffic numbers have dropped, but this is probably caused by a loss of spam referrals, not real visitors. Google confirmed that PageRank values are being removed from its toolbar and tools. Google SERPs have been including more and more image thumbnails in snippets lately. There's been no announcement of a format change, but Google seems to be testing this feature more frequently lately. A new program called Google+ Create rewards active content creators with a verified Google+ profile and benefits such as early access to new features and more exposure for their content. Applicants must meet certain requirements. Bing Ads announced new tracking parameters for advertisers to track: Campaign, AdGroup and Network. On the heels of that announcement, Bing also launched automatic tagging for parameters in Bing Shopping Campaigns and Image Extensions. A third new feature for Bing Ads still being tested: showing Social Extensions, or links to an advertiser’s social media pages, prefaced with “Find more:” right below an ad. Pinterest is now offering ad targeting based on an email list. Advertisers can more precisely target the audience they want to reach if they upload their email addresses. LinkedIn launched audience-match ad targeting this month. Unlike other social media networks offering audience match based on email addresses, the LinkedIn version is geared for B2B marketers and lets advertisers upload a list of companies. LinkedIn will deliver ads to people who work for those companies. Facebook acquired Masquerade, a start-up app for video selfies with fun filters. The potential Snapchat rival will remain a standalone product, though with an enormously expanded audience. Instagram announced it is testing an algorithm-based, personalized feed that will put popular posts the user has missed at the top, rather than showing all posts in chronological order. Twitter is pushing out its new algorithm-based timeline by default. Users have the “Show me the best Tweets first” setting automatically enabled even if they previously turned it off, making this an opt-out feature rather than opt-in. Anyone who wants to keep the straight reverse-chronological feed must now manually change that setting. Twitter will discontinue its TweetDeck app for Windows on April 15. Users can still use TweetDeck via the web version rather than the standalone app. In addition, Twitter and TweetDeck now provide a seamless login — when a user is logged in to one, the other is automatically logged in, too.